Edward Sokol always knew he would be an artist … from his first crayon drawings on the wall at age three, through his formal training at New York’s High School of Music and Art, and Hunter College, where he received a Bachelor of Fine Arts degree in painting. Upon graduation, Sokol taught elementary school while pursuing a career as a working artist. To his great surprise and delight, at the end of one year, and after only a few outdoor art shows, two New York art galleries offered to represent him. Soon he was working full time as an artist. One show led to another and his list of collectors began to grow. In 1977, Sokol was introduced to Felicie. 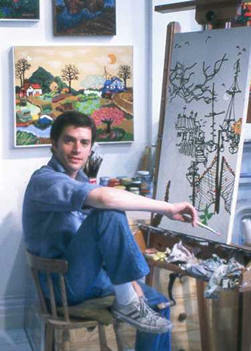 Enchanted by his paintings, she became his exclusive publisher for his limited edition graphics and exhibition posters. With her worldwide distribution to galleries, she began producing his editions. In Paris, she came up with a special embossing technique on many of his lithographs to accentuate his striking use of lines. In New York, Felicie had Sokol work on his silk screens using enamel inks to bring out the vibrancy of his colors. She held numerous exhibitions of his paintings in her gallery, and his limited editions and posters were on view year round. One of the most distinguishing characteristics of the artist’s work is a highly sensitive and seemingly innate sense of color. Whether using a palette of strong or soft colors, Sokol creates pleasing and unique works of art, and is equally at home using both figurative and abstract forms. Despite this diversity, his work is highly recognizable, adding to its appeal for his collectors. Over six thousand of Sokol’s paintings, drawings, collages, sculptures and Limited Edition prints are in public, corporate, museum and private collections around the world. His work has been exhibited at the Metropolitian Museum of Art, in New York City, and was honored to have three of his works chosen by the State Department in Washington D.C. for inclusion in their Art in the Embassies Program.